Karigan G’ladheon, unjustly suspended from school for drubbing a bully, runs away instead. 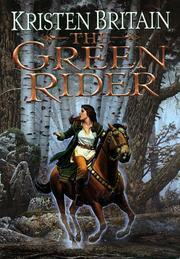 On the road she encounters a dying Green Rider, or king’s messenger, F’ryan Coblebay. Hunted by evildoers, and pierced by two black arrows, the Rider makes Karigan swear to deliver his vitally important message, then gives her a magic brooch that renders her all but invisible. Karigan also acquires Coblebay’s mount, The Horse, who seems to know better than she does how to find Sacor City and King Zachary. While enjoying various adventures, she’s chased by agents of Lord-governor Mirwell’she’ll eventually learn that he’s supporting the rebel Prince Amilton’s bid to seize the throne. Worse, another conspirator, a magic-powered, elf-like Eletian renegade called Shawdell, has broken the D’Yer Wall, whose spells protect Sacoridia from the evil creatures of Blackveil Forest. Finding within herself unexpected talents and survival skills, Karigan eventually reaches King Zachary—but the message she brings is worthless. Then she remembers that Coblebay also entrusted her with a love letter. It’s this that contains the real message, a warning of the plot against Zachary. A fresh, well-organized fantasy debut, with a spirited heroine and a reliable supporting cast.